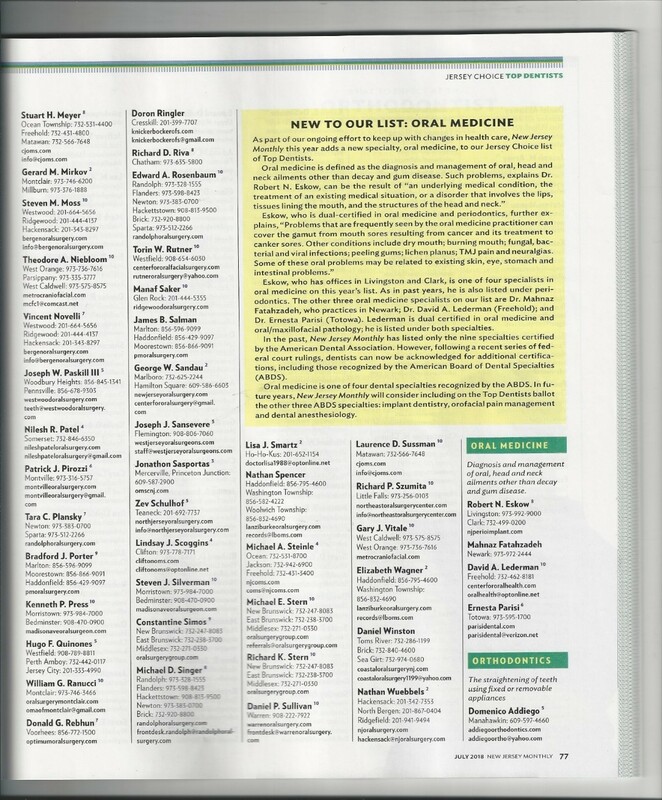 The American Academy of Oral Medicine wishes to thank Dr. Robert Eskow for his continued support of AAOM and for helping to secure a listing of oral medicine as a specialty in the NJ Monthly – Top Dentists issue. The American Board of Oral Medicine (ABOM), and oral medicine is a recognized specialty of the American Board of Dental Specialties (ABDS). We encourage those who subscribe to a similar publication to contact the editor and have oral medicine and those oral medicine specialists listed. Congratulations to Dr. Robert Eskow, Dr. Mahnaz Fatahzadeh, Dr. David Lederman and Dr. Ernesta Parisi who are Diplomates of ABOM and recognized oral medicine specialists practicing in New Jersey.